Radio controlled model sailing is a hobby without limits. It includes design and building for the serious hobbyist, cutthroat competition for the adrenaline-addicted, and the pure eternal beauty of a vessel cruising along, powered only by the wind. Organized model sailboat racing has been documented since the 1800's. But real growth coincided with the development of light, reliable, and inexpensive radio controls. The model skipper can duplicate the tactics and boat handling capabilities of his counterparts in big boats. The laws of scale, however, dictate that things happen more quickly with model boats. A partial day's racing at a local regatta will easily have 10 to 14 starts and many more mark roundings. Interestingly, model yachts race under the same ISAF rules (International Sailing Federation) as big boats do with a few exceptions. ISAF-RSD covers radio control yachts. The Florida EC-12 Association sails the East Coast 12-Meter yacht. Graceful overhangs with a sweeping sheer hark back to the golden age of yachting. 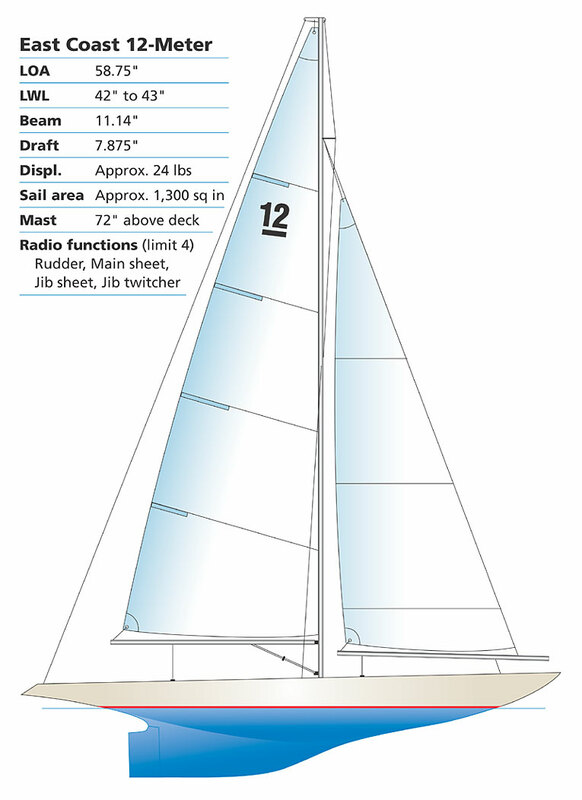 The EC-12 is about five feet long, displaces 23 pounds, has a six-foot mast, and carries 1,300 square inches of sail. The heavy-displacement full-keel hull of the EC-12 differs from most other model yacht classes, which tend towards lighter hulls with exaggerated fin keels and bulbs for ballast. In the 1960's, the famed naval architect Charlie Morgan, designed a 12-meter yacht as a potential defender in the 1964 America's Cup. The full sized boat was never built, but the 9/10 inch to 1-foot scale tank test model survived and was used to make the EC-12. The EC-12 is a restricted one-design class. Fiberglass hulls are made from identical molds and must be purchased from an approved manufacturer. Construction materials and dimensions are also restricted, sail dimensions are controlled, and radio functions are limited to four--rudder, main sheet, jib sheet, and jib twitcher. All other rig tuning controls--boom vang, cunningham, outhauls, stay tension, topping lift, etc.--replicate those on full size boats but must be manually set rather than radio controlled. The result is a class of boats with similar speed potential. As with any good restricted design class, racing success is determined by boat handling abilities. Model Yachting is the ideal hobby. Properly cared for, boats last forever. A beginner can be handed a transmitter with complete confidence. It is easy to sail, typically with only a rudder and sail control. Yet the simplicity masks a complexity of skills which can take a lifetime to master. Young and old, beginner to old salt, model yachting has something for everyone. Above all, model yachting is fun. Pure fun. Model yachting is a quiet, photogenic, non-polluting pastime. You will never be thrown off a pond! Instead the person who comes up to you might have some of the same questions you have now, the questions we hope to answer in this brochure. Why an EC-12 instead of another class? Traditional appearance - We hear all the time what pretty yachts EC-12s are. Sweet proportions. Graceful sheer. Traditional, yachty look. Think of them as functional art. Appropriate size - We are not the biggest nor the smallest of the AMYA classes. The EC-12 is the right size for easy car transport, and is big enough to handle open water with ease, yet the low-drag full keel displacement hull form excels in light air and eliminates weed problems common to fin keel boats. You'll be amazed at the control you can have in tight quarters. The EC-12 is a model yacht, not a toy boat. Long history with a stable class rule - EC-12s are time tested. As one of the earliest classes sanctioned by the AMYA, the class celebrated 30 years of active racing in 2000 with well over 1,500 boats registered during that time. Boats built in the 1970's can be updated to sail competitively in the class, proof that the one-design class rule works. A new EC-12 can be a potent performer, and will remain so for a long time. Best documented model yacht class - The class promotes the free exchange of construction, configuration, and handling technique information. The Class is supported by two major books totaling 380 pages of text, drawings, and photos of EC-12s inside and out. Information is also available on the Internet at sites like www.ec12.org and www.ec12.info. This means that newcomers have immediate access to all the go-fast and latest thinking about the boat. Class member support and information exchange - Our 12 Discussions Forum is the best way to stay up to date on all the things going on in the class, to exchange building and tuning tips, find out about regattas, and post questions to other EC-12 skippers. Join here: www.ec12.org/Clubhouse/Discussion.htm. Excellent after-market support - We are blessed with a healthy number of hull manufacturers, who supply additional key components such as decks and ballasts. A range of specialty manufacturers produce everything from sails to boat cradles and fittings. Country-wide sailing - Most EC-12 racing occurs at the club level and you will find fleets across the US racing in small to large fleets. Some regional racing circuits exist such as the Florida Championship, the Dixie Cup, and the Colonial Cup. Premiere AMYA national class - If you decide that competitive racing is your interest, the EC-12 is what you have been looking for. Effective sailing of this model requires patience, anticipation, and a substantial commitment to doing a good job. Skippers who compete in the class do so because this is where the top US skippers eventually gather. At a 30 boat National Championship, it is not unusual to find that upwards of 50% of the fleet has won Regional and National Championships in other classes. EC-12 National Championship events rotate through the six AMYA Regions on a regular schedule, so sooner or later you'll be able to try your hand. The hobby shops in your area are the place to go for building supplies and radios. The hulls have to be obtained from authorized manufacturers. Used boats are also available. See the AMYA Suppliers page on the Web at www.theamya.org or check out the EC-12 Class page at www.ec12.org or the building site at www.ec12.info. Are there any races I can enter? Yes. Most of the local clubs of the Florida EC-12 Association have regularly scheduled sailing days throughout the year. And many of the clubs also race other class boats besides the EC-12. You do not need prior experience to enter, but getting to the finish line first will be a challenge!